It seems that the strike is going to go ahead, barring some last-minute negotiations. The Canadian Auto Workers union issued this release at 08:30 Eastern this morning and VIA responded shortly afterward. It seems they are far apart. The strike is set to begin at 12:01 AM (time zone not specified). At that point management will run a reduced set of trains and services as I previously said. I sure hope that they can come to an agreement quickly. I believe VIA Rail is endangered in this country and the strike will not help. I do not think that many people are going to be sympathetic to the union but time will tell. I'll gaze into my crystal ball and predict back to work legislation will be implemented within 7 days. VIA Rail has posted a detailed notice about the looming (potential) strike. VIA plans to run its trains at a reduced frequency and only with Economy class. The Hudson Bay Winnipeg-Churchill train to depart Winnipeg on Tuesdays and Churchill on Thursdays. The Sunbury-White River train will continue to operate as normal, because it is operated by Canadian Pacific crews. Note that there would be no sleepers and no diners. The cars may or may not be on the train but they will not be in service. Limited snacks would be available in trains with Skyline cars. Tickets will have to be purchased online only and only a few stations will be staffed. 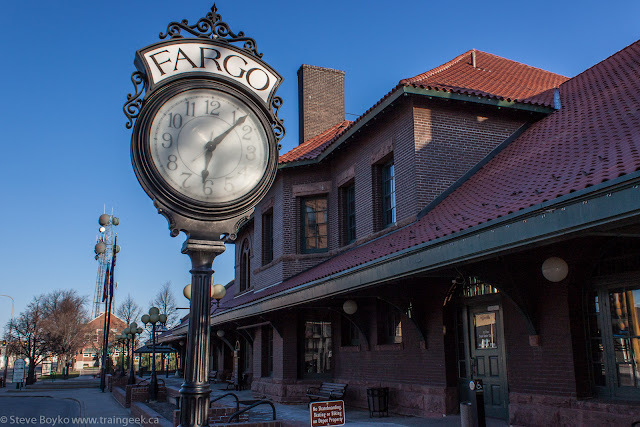 After my little reconnaissance mission in Fargo, I was able to head out for a few hours in the morning of May 12 to see some trains. I got up at pretty much the crack of dawn and left the hotel (the Hilton Garden Inn, a very nice place) to head downtown. I saw the grand Northern Pacific depot and decided to take some photos there. As you can see, the shadows on the caboose and display train were a bit long at 06:50! Apparently this caboose was Great Northern X227. It used to have a Great Northern logo on it but not at this time. I heard some train horns so I decided to try to get a shot of a train with the depot in the background. Soon I saw an eastbound freight approaching, but it stopped by McDonald's and waited. The reason became obvious when a fast westbound intermodal came around the corner. This baby had five engines on the head end, led by Dash-9 BNSF 5122. Within five minutes, the train was gone and BNSF 6222 was on its way. BNSF 9071 was pushing on the rear of the coal train. After those two trains passed, I wandered around the depot, taking a few photos. Soon enough another train came rolling in, only to stop by the McDonald's. Note the trailers on this intermodal train. The BNSF Twin Cities division headquarters is right there too, and it looks like they did a crew change. Soon enough, BNSF 4920 was on its way past the depot. Here's a shot of a couple of UPS trailers of differing sizes. Trailers on flat cars (TOFC) are quite common on BNSF through Fargo, whereas they are a rarity in Canada with only a few holdouts like the Hudson Bay Railway between Thompson and Churchill. I think CN and CP consciously got out of the trailer business several years ago, although blog partner Trackside Treasure notes they were in the business for several decades. I photographed UPS, FedEx, TIP Intermodal, Roadway, YRC Worldwide, Clipper, HMD, and Alliance Shippers trailers. All of that action took place in less than an hour. After those three trains, I headed east into Minnesota to the Dilworth yard to see what was up.. There were two more deep cuts recently in the "death of a thousand cuts" affecting rail service in northern New Brunswick. The first was the planned end of mining at Brunswick Mines (outside Bathurst) on May 1. Once the largest zinc mine in the world, it was in operation for 49 years. Here's a great video on the history of the mine. This was the major customer for CN on the Nepisiguit subdivision. The last train to the mine (CN 566) ran on May 3 and it returned as CN 567 on May 4 to unload at Belledune at Xstrata's smelter, which will remain open for the time being. Michel Boudreau posted this video of the last of the blue ore cars used in the mine service leaving Bathurst a few days afterward. Here's a video I took of two New Brunswick East Coast Railway RS-18s powering the empty ore train on its way to the mine. The second cut, a direct result of the first, is the final closure of the Campbellton shops. Since there are no more ore cars to repair, CN has laid off the last five of the car repair crew at the shops and their final day was yesterday. The shop area dates back to the opening of the Intercolonial Railway. 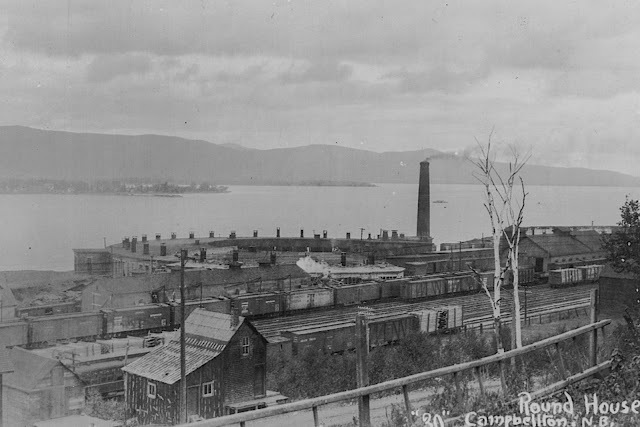 At one time Campbellton boasted a roundhouse, turntable, and workshops. The shops dwindled in importance over the years, but enjoyed a resurgence during the New Brunswick East Coast Railway years when the NBEC (and subsidiary Eastern Rail Services) was based out of there. I had the pleasure of touring the area in 2009 but by then it was being sold to CN. Tim Jaques, editor, wrote a nice article in the Campbellton Tribune about the closure of the shop on May 31. I can't show it here because it's behind the Brunswick News paywall. However, if you are a member of the excellent RailsNB group on Facebook, you can read it here. More cuts, and more to come. It's hard to be optimistic about the future of rail service in northern New Brunswick. The Canadian Auto Workers (CAW) union has issued a 72-hour strike notice. The CAW represents VIA's customer service, on-board service and maintenance workers. They do not represent the engineers, who are represented by the Teamsters. The CAW has been in negotiations with VIA since this past October and the membership voted 94% in favour of a strike. The CBC is reporting that they have said they won't walk out until at least June 14. The strike notice said its members are frustrated with the recent changes in VIA, including the reductions in service and drop in federal subsidy. There are no specific details on what the outstanding issues are, but it seems that salary is a significant part of it. You may remember that the CAW last threatened a strike in June 2010. It's like last time... negotiate starting in October, threaten to go on strike in June. I suspect the timing has to do with the summer season. Last time, VIA posted a contingency plan that had management attempting to run most Corridor trains and running the other trains once a week. I find it interesting that the same URL now shows "Access denied" and not "Not found". There is nothing yet on the VIA "media room" page about the strike notice. UPDATE: Details are now posted.